The latest phase of the Baiter Sehat campaign, run in partnership with Blackburn with Darwen Council, has focussed on further community engagement about organ donation, mental health and suicide and drugs and alcohol. 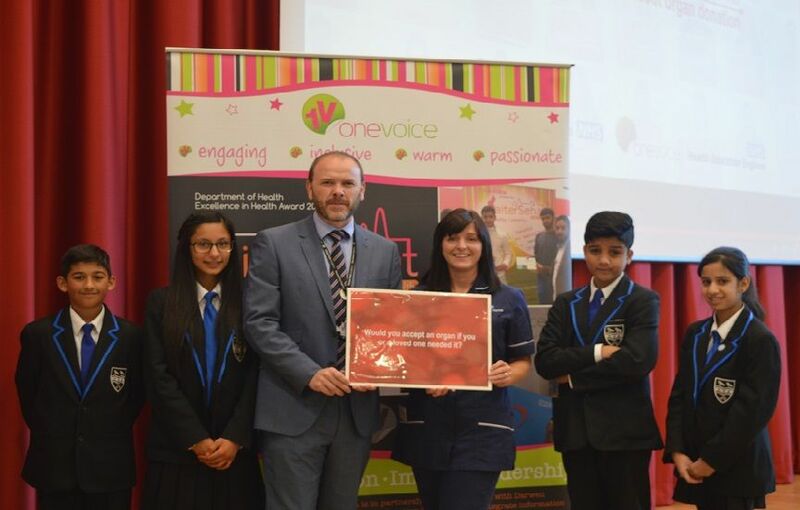 The video was presented to 1000 students over five assemblies at Witton Park Academy with a short talk following about organ donation and transplantation. Students engaged extensively with award-winning specialist nurse Angela Ditchfield who has spearheaded the campaign. She said: “The aim of the presentation was to highlight the issue simply to raise awareness of the need for organ donors. The ‘It’s About Time’ campaign video resonated with many in the audience. Through my work as lead nurse I have seen how organ transplantation can have a huge and life changing impact on people’s lives. Speaking at Witton Park was a great opportunity to share my experiences. The aim of the Baiter Sehat project is to deliver both community education initiatives and integrate information into existing health promotion activity in the local BME community. Witton Park is delighted to be able to support the NHS and One Voice (through the Baiter Sehat campaign) in raising awareness of the need for organ donation. Pupils have really engaged with the message, I’m sure it will have a positive impact. Nearly 10,000 people in the UK are awaiting transplants, with a quarter coming from the BME community. But less than two per cent of donor card holders are from the South Asian community. The campaign has already highlighted issues including Forced Marriage, Mental Health and Well Being, Domestic Violence, Health Checks, Shisha Smoking, Cardiac Rehabilitation and Suicide.